Living on planet earth over the last 60 years or so has had a detrimental effect on our bodies and mind. Our 21st century lives bombard us with excessive amounts of toxins, both physically and mentally. On top of this, we’re so disconnected from nature and our surrounds, that what’s demanded of us in order to stay or get healthy – is to periodically undergo some form of detoxification. This means taking a break from environmental pollution, contaminated food and water, unhealthy eating and drinking habits and thought patterns, and continuous emotional, physical, invisible (mobile phones microwaves, wifi) and chemical stress, and an ever increasing dependence on western drugs. PK gives us this opportunity. This is an individually designed combination of massage (and other treatments), herbal medicine, a simple and light diet, and removing all stress from the body and mind. These treatments are designed to purge physiological stress and accumulated toxins out of the body that are preventing our own natural state of good health. I had my treatments from 9am until about noon each day, with the same two nurturing therapists daily. I know this sounds blissful, and it was in the beginning. But after about a week of daily 2 hour massages, sometimes followed by enemas, it gets harder and harder to lie there, and receive. 21 days is definitely enough. The massages are many and varied, depending on your own dosha (your constitution) and the reason why you’re there. That is, the state of your health. 1. ABHYANGAM: Therapeutic oil is lightly applied from head to toe, to soothe sore muscles, increase energy and rejuvenate all your senses. It also helps improve mental alertness, circulation and sleep. 2. 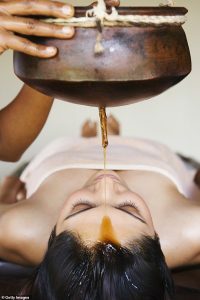 SHIRODHARA: This is the signature Ayurvedic massage from body, mind and soul. A continuous stream of medicated oil falls gently on your forehead from a specific height through a specially made apparatus. Regular treatments improve memory, flush out impurities, nourish the hair and scalp, release stress and strain and deeply relax the nervous system. It also stimulates arterial and lymphatic circulation. I had one of these each day! The deep state of rest (or transcendence) I experienced each time was profound. 3. 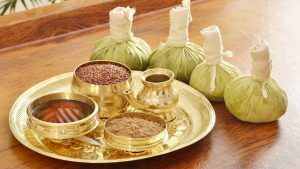 UDWARTHANAM: Powdered herbs and pastes are used to exfoliate the body using special strokes designed to deeply cleanse the skin and its pores by breaking down cellulite under the skin, leaving your skin soft and glowing, and helping to remove excess fat. This massage will also stimulate blood flow and eliminate toxic residue from your tissues. 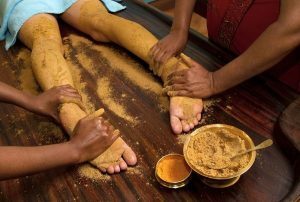 Dry massage – the therapists use powdered herbs or pastes. These massages are designed to stimulates the blood circulation and also to exfoliate the skin. You’re so clean and smooth after this treatment. 4. PIZHICHIL: Warm oil is squeezed all over the body, whilst being gently massaged. It’s kinda heaven! 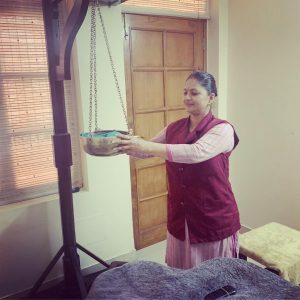 This massage is designed not only to put you in a state of bliss, but also (or because of) to reduce blood pressure, body aches and pains, and helps heal rheumatoid (joints) conditions, as well as giving your immune system a big boost. 5. ELAKIZHI: Bundles of muslin are filled with herbs and powders, then twisted before being warmed in medicated oils. They are then used to massage the entire body, whilst shifting/rocking the person from side to side. This technique increases circulation, promoting perspiration, allowing dead skin to be eliminated. It’s also toning and ever so relaxing.